It takes vision to transform a natural setting like this to an outdoor living space you can enjoy all summer long. Paramount starts where you need us to – whether it’s making your vision come alive or creating an original design especially for your property. 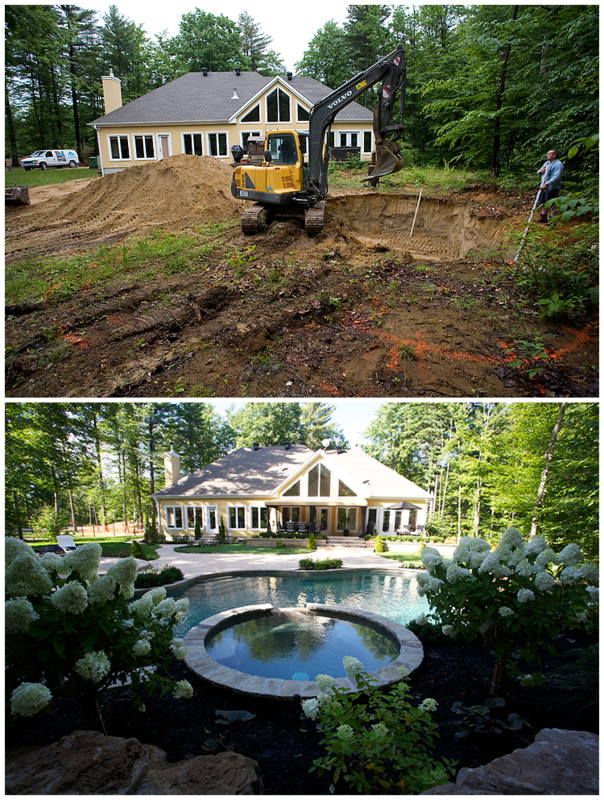 This beautiful country house with its clean lines needed a landscape design that wouldn’t overwhelm. It had to be natural and feel like it was an extension of the house, as if it had always been there. And the end result doesn’t disappoint. It’s light and airy and suits the house perfectly. The circular spa framed by the limelight hydrangeas feels like it’s growing right out of the woods. The circular theme continues with the flowing lines of the pool and the curves of the walkways and terraces. The stonework is light-coloured, adding to the sunny feel of the backyard space and small gardens punctuate the design, breaking up the stonework so it doesn’t overwhelm. And the view from the house is equally enchanting with a pleasing view in all directions.